Death reveals that he has kidnapped Juntarra in order to get the Mutanimals to seek him out. However, the mutants are ahead of schedule, so the skeletal villain cooks up some distractions. 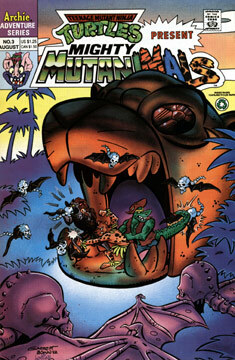 The Mutanimals return to Jagwar’s palace. Jagwar explains that they next have to face the Jaguar Spirit to continue their quest. Ray Fillet doesn’t understand why they just can’t skip ahead to the east, where they know Death holds Juntarra. Jagwar explains that they have to follow the spiritual path in the proper order, or the route will not open ahead of them. Ray struggles with accepting that the supernatural is real, and as Jagwar assures him that it is, the Jaguar Spirit arrives. The Spirit takes Ray’s astral projection on a journey, where we see Ray’s origin retold. As the events that followed that unfold, the Jaguar Spirit suddenly pulls Ray’s astral form back to his body, as it senses great danger. As soon as Ray has recovered, the Mutanimals are attacked by Death’s first distraction – a group of bat-winged skulls. Our heroes defeat their adversaries, but as soon as the coast looks clear, a giagantic fire monster looms over the jungle and tosses fireballs into the jungle and at the Mutanimals. Ray Fillet gets the beast to chase him through the thick foliage and into a hidden lake, where it is doused and defeated. Back at Death’s fortress, Juntarra has recovered and tries to find an escape route. As she spots an opening high above her, Null arrives.